Eva Jean Reffner age 97 of Findlay, OH and formerly of Garrett, IN was called home on Thursday morning , January 31, 2019 at Blanchard Valley Hospital – Findlay, OH. Eva was born on November 17, 1921 in Garrett, IN to Arthur K and Nell (Pool) Hickman. On August 5, 1950, she married Robert Glenwood Reffner. He has been waiting for her in heaven since September 20, 1989. She was a lifelong resident of Garrett, with the exception of the 7 years in Findlay, OH and 7 years in Portage, IN. She was valedictorian of the Portage High School class of 1939 and an honor graduate of International Business College in 1941. She was a secretary at the General Electric Company for 14 years. 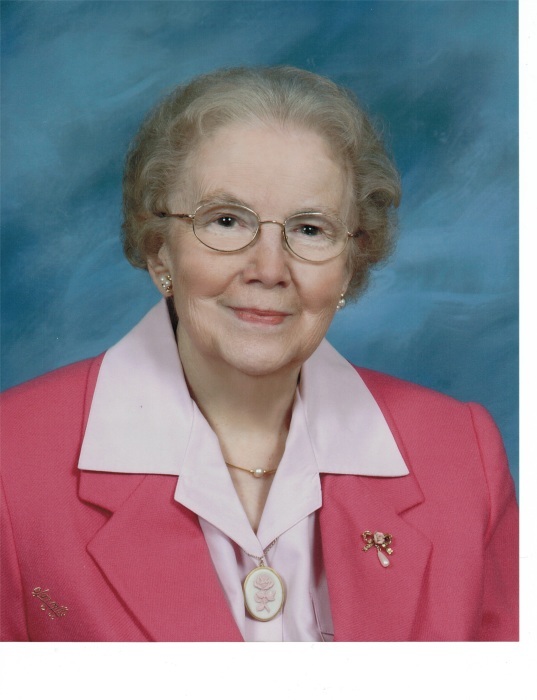 She was a 65-plus year member of the Garrett First Church of Christ, where she had been secretary of the WinSome Class, a member of the XYZ Bible Study, the Ladies -of-the-Church, and was the assistant librarian for many years. She also has been a longtime volunteer at the Garrett Chamber of Commerce, a member of the Garrett Historical Society and the DeKalb County Humane Shelter, from where she adopted her beloved dog, Freckles. She dearly loved her family and friends. She enjoyed reading, photography, crossword puzzles, as well as sending cards to, and e-mailing friends and family. She also enjoyed raising flowers, but was confined to enjoying them in hanging baskets in the later years. Surviving are her son Paul and daughter-in-law Patricia of Findlay, OH and grandson Stephen of Troy, OH. Also surviving is a niece Elizabeth Millan of Highland Park, IL, plus 4 great-nieces: Cynthia (Tim) Cannon, St. Charles, IL; Belinda (Dan) Johnston, Marengo, IL; Melissa (George) Metzger, Kingston, IL and Elizabeth (Jamie) Brusslan, Chicago, IL. Also surviving are 5 great nephews: Jeffrey (Rebecca) Hickman and Joel Hickman, Champaign, IL; Greg (Paula) Millan, Naperville, IL; Alex Millan, CO and Asis Millan, Highland Park, IL. She also enjoyed being with her great-grand-nieces and nephews: Allison and Valeri Cannon, Jacob and Nicole Johnston. Memorials may be made to the Garrett First Church of Christ or to the DeKalb County Humane Shelter.